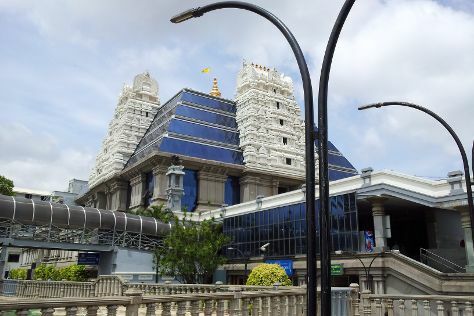 Bengaluru is known for historic sites, parks, shopping, theme parks, and wildlife. Your plan includes some of its best attractions: get in on the family fun at Wonderla Amusement Park, get a taste of the local shopping with UB City, take in the spiritual surroundings of ISKCON Temple Bangalore, and stroll through Cubbon Park. To see traveler tips, more things to do, and other tourist information, use the Bengaluru trip maker . The Route module can give you travel options from your home to Bengaluru. In April, daily temperatures in Bengaluru can reach 41°C, while at night they dip to 26°C. Finish your sightseeing early on the 12th (Fri) so you can travel to Manali. Manali is known for nature, historic sites, fun & games, winter sports, and museums. Your plan includes some of its best attractions: admire the verdant scenery at Solang Valley, explore the activities along Beas River, take in the spiritual surroundings of Hidimba Devi Temple, and get great views at Gulaba. To see reviews, more things to do, traveler tips, and more tourist information, use the Manali itinerary planner . You can do a combination of flight and taxi from Bengaluru to Manali in 10.5 hours. Alternatively, you can do a combination of flight and bus; or drive. On the 17th (Wed), wrap the sightseeing up by early afternoon so you can travel back home.